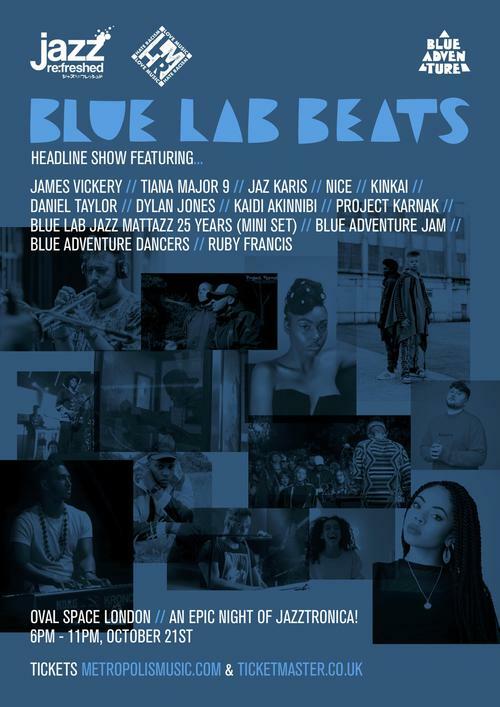 Blue Lab Beats displays a forward thinking reimagining a future where the energy from the music and people affect the surrounding environment, while embodying the richness of various music cultures. The duo’s first project Blue Skies EP helped increase their reach and introduced them to platforms all over including two appearances on Jazz FM playlists. The duo have also appeared on BBC Radio 1, BBC 1Xtra, BBC 6 Music, Boiler Room, as well as at infamous jazz bar Ronnie Scott’s. The soft, laid back horns which adorn many of their boom-bap inspired beats have become a staple sound in London’s contemporary jazz scene. Although representing London’s reinvigorated contemporary jazz scene, Blue Lab Beats find inspiration in a new wave of soul-inspired jazz coming from all over the world through Hiatus Kaiyote, Moonchild, Eric Lau and even Kendrick Lamar. But there’s also a neo-soul richness to the duo’s music found in the likes of J Dilla, Erykah Badu and Slum Village. Blue Lab Beats’ early successes have seen them grace the stages of Afropunk, Glastonbury 2017, WOMAD, and Love Supreme festivals.